Learn more about the wide variety of mature native and exotic trees that line the streets of downtown Leesburg. 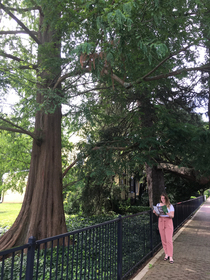 Leesburg, VA (August 13, 2018) – The Leesburg Tree Commission has published a new brochure, which highlights 23 native and exotic trees in downtown Leesburg. The trees are a part of the original town layout, which was created by John Hough in 1758. According to Chairperson Patricia Hatfield, the Tree Walk was designed to evoke a deeper appreciation of the mature trees while reminding us of the people who planted them 100 or more years ago. The brochure includes tree descriptions and locations, which cover an 8-block section of downtown. Print copies of the brochure are available at at Town Hall or a digital copy can be downloaded from the Town website at www.leesburgva.gov/treewalk.